I am not a great lover of salmon and I wouldn’t order it in a restaurant, but when I saw this recipe and read the ingredients, I decided that I really should try this out as I knew my husband would love it. 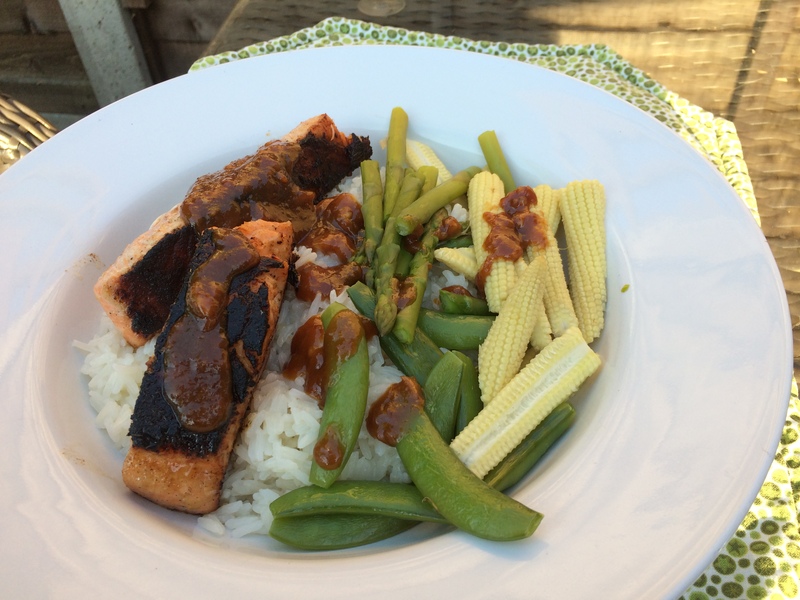 It has ‘almost’ changed my mind about salmon as it was decidedly delectable; the salmon retained all of its moisture and flavour but was encased in a delicious coating of the sticky marinade. The coconut rice was divine; not something that I normally cook but I will definitely be cooking it again fairly soon. 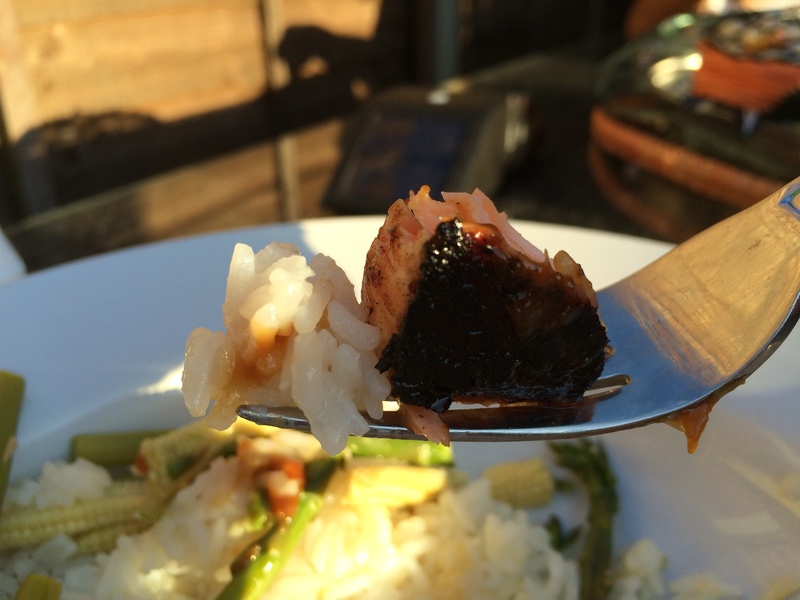 The marinade/sauce was to die for….. The dish looked so tempting that I forgot to add the coriander and pepper flakes before serving! Add all the ingredients to a bowl and whisk until combined. Place the salmon fillets into a storage bag with 2 tablespoons of the marinade and leave in the fridge for at least 30 minutes, or overnight. Keep the remaining marinade in the fridge until you are ready to cook the salmon. Bring the coconut milk, chicken stock, honey, butter and salt to the boil in a medium-sized saucepan. Stir in the rice, cover and simmer for 15 minutes or until liquid is absorbed. Fluff with a fork to serve. Once the rice is cooking, heat the sesame oil in a large fry pan over a medium heat. Add the salmon fillets (skin side up) until you can see that the salmon is cooked half-way up the sides – about 4 minutes. Carefully turn the salmon over and cook for a further 4 minutes or until just cooked through. Whilst the salmon is cooking, steam your vegetables and put the remaining marinade into a small saucepan; simmer until it is slightly thickened and reduced by about half. This entry was posted in Dinner and tagged Coconut, Dinner, Ginger, Gluten Free, Healthy Eating, Jasmine Rice, Salmon, Tamari, Vegetables. Bookmark the permalink.